We continue our series across service sectors familiar to Chicago. Our focus this month is Insurance. Joining us are distinguished KM professionals, Neeru Arora, Chief Knowledge Officer for Aon plc, and Robert Burns, Director of Knowledge Management for MetLife Group Benefits Operations. Moderating this roundtable session is Dr. Anthony J. Rhem who recently published Knowledge Management in Practice (CRC Press, 2016). Our accomplished panelists will describe challenges unique to insurance, articulate successful approaches, and share stories from the recent past. Members from the audience are welcome to interact and help bring distinction and contrast to the Insurance industry. Neeru Arora is the Chief Information Officer (CIO) for Aon Service Corporation and, Chief Knowledge Officer for Aon plc. She leads an organization of 250 colleagues, focused on enabling growth, operational efficiency and stability. She is responsible for a vast number of portfolios, including sales and marketing, financial management, human resource management, procurement, legal, audit, compliance and treasury. Additionally, Neeru is accountable for the creation and execution of Aon’s Knowledge Sharing strategy, part of the unmatched talent agenda. Under her leadership, the firm will continue to develop capabilities that make it easier for colleagues to find expertise, content and communities to better serve our clients, drive growth, and improve colleague productivity. She is also responsible for delivering Aon’s new global intranet and collaboration tools to enhance communications capabilities and help build a connected company. Neeru is a proven leader with over 20 years of experience, developing, driving and implementing strategies for growth and operational excellence within large organizations. Prior to joining Aon, Neeru served as a consultant at McKinsey, where she worked with global clients from various industries, focusing on areas of technology management, operations outsourcing and financial transparency. Prior to McKinsey, she served as a Director and Chief of Staff to the Global CIO at UBS. Neeru started her financial career at the Chicago Board of Trade where she was a Fixed Income Economist and led many public investigations in partnership with the Commodity Futures Trading Commission (CFTC). Neeru holds a Bachelor of Science degree in Finance and Economics from Loyola University. Robert Burns enjoys over 20 years of creating and building strategic Knowledge Management (KM) platforms that enable the business to achieve its goals. Additionally, Robert has leveraged past experience with education, technology consulting, business training, and on-the-job KM experience to approach KM holistically and integrate it into organizations at the process level and culturally. Having the opportunity of starting KM from the beginning in multiple organizations forced him to find several methods to influence & educate leadership and associates; plus ways to show KM’s value. He describes two key success factors: 1) Focus on evolving KM governance and processes to establish a solid, but agile foundation that is continually aligned with the business strategy and culture (without a solid KM foundation the KM solutions and technologies will not be as effective or sustainable); and 2) Build KM platforms that focus on providing content that is easily available at the time of need, specific to an associate’s role and task, and integrated into the target process and/or application. Robert believes that we must focus on better enabling associate proficiency toward the achievement of organizational goals. For the future, he looks forward to exploring the evolving capabilities from Performance Support, data analytics/big data, and cognitive computing. Additional background: 1) High school and college mathematics instructor, Unisys, Grant Thornton, Hitachi Consulting, and currently director of KM at MetLife for 14 years. 2) Has presented at several KM World annual conferences and at APQC KM Conferences. In 2015, MetLife was one of five companies chosen for the APQC Connecting People to Content Best Practices Study and Report (link). Dr. Anthony J. Rhem is a knowledge management consultant, trainer and researcher. He is an Information Systems professional with over thirty years of experience. As a Knowledge Management consultant he serves as adviser, strategist, information architect, and governance strategist in multiple industries including insurance, healthcare, legal, finance, and education. Recently a Professor and Director of Research at the Knowledge Systems Institute (KSI), he is now the Chairperson of the Board for KSI. Anthony is the author of many books and numerous articles including UML for Developing Knowledge Management Systems (CRC Press, 2005), and co-authored Knowledge Management in Law Firms: Expertise in Action (GLB, 2016). Dr. Rhem was educated at Purdue University (BS and NCAA Final 4 champion), DePaul University (MS), and Walden University (PhD). He is actively involved in national and international committees to strengthen KM education and awareness. 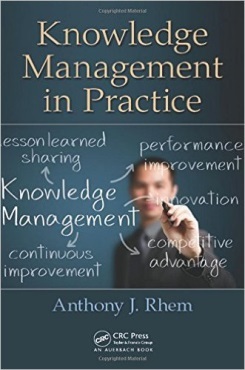 Dr. Anthony J. Rhem discusses current KM issues from his latest book, Knowledge Management in Practice (CRC Press, 362 pages) which examines practical KM applications across multiple industries. Since 1998, Tony has assisted organizations adopt KM strategies and practices—eighteen years’ experience implementing processes appropriate for each and every company within the various industries. KM Chicago will leverage this knowledge in a new series of expert led discussions which focus on one industry at a time. Tony will kick off the series by discussing relevant KM practices that are unique to certain industries. Tony will also highlight KM tools that are found in common among other industries, and explain how the underlying theory remains intact from one profession to another. He will storybook how successful practitioners and consultants have found ways to translate theory into practice for each particular industry. For each Industry Focus, Roundtable event we will have KM specialists in a specific industry provide their insights on how they resolve industry specific problems by applying KM best practices and solutions. Dr. Rhem will serve as moderator. Dr. Anthony J. Rhem serves as the President of A.J. 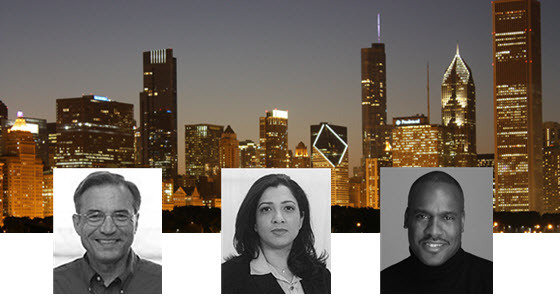 Rhem & Associates, Inc., a knowledge management consulting, training and research firm in Chicago. Dr. Rhem is an Information Systems professional with over thirty years of experience. As a Knowledge Management consultant he serves as adviser, strategist, information architect, and governance strategist in multiple industries including insurance, healthcare, legal, finance, and education. Recently a Professor and Director of Research at the Knowledge Systems Institute (KSI), he is now the Chairperson of the Board for KSI. Anthony is the author of many books and numerous articles including UML for Developing Knowledge Management Systems (CRC Press, 2005), and co-authored Knowledge Management in Law Firms: Expertise in Action (GLB, 2016).